Previously known as the famous Ceylon city, Sri Lanka is one of those places which have both cultural history and mythological history attached to them. I have been meaning to go to Sri Lanka for sometime now but there was never a concrete plan. In fact, when I finally did travel to Sri Lanka in October, I did it quite spontaneously. I was supposed to go to Italy with my best friend but due to unforeseeable circumstances, I had to cancel my tickets. However, I just couldn’t go somewhere and so, just 20 days before my Italy departure, I booked my tickets for Sri Lanka and applied for an E-Visa too. It was simple and my whole booking was done in just a couple of minutes, that is how I knew that this is where I was actually supposed to go. Although, I would highly suggest you to go in January, in fact it is rated as one of the best places to visit in January. In this post, I will cover my itinerary and all the amazing places that I chose to explore in the 14 days of traveling. I researched a lot and I knew I couldn’t complete the whole country in just two weeks (Yes, Sri Lanka isn’t that small! ), so I shortlisted a few places that I really wanted to visit. I left India on 30th September and landed in Colombo around 11 a.m in the morning. I had to reach my hostel – Colombo Jumbo Hostel from the airport and since I was traveling on a low budget, I took a local bus to Colombo from just outside the Airport’s departure section. It cost me 130 LKR (60-65 INR) only to reach the city and took around 1.5-2 hours to reach the Colombo city bus stand. From the Colombo bus station, I had to take another bus to reach my hostel which cost around 10 LKR (4-5 INR) and took only 15-20 minutes. The best part about Colombo buses is that you can download the Colombo Bus Route app and find the exact bus number which you will need to board to travel locally in Colombo. I reached my hostel around 2 p.m. so I just relaxed a little and explored nearby places and eating joints and just had some interesting conversations with fellow travelers who were staying in the hostel with me. 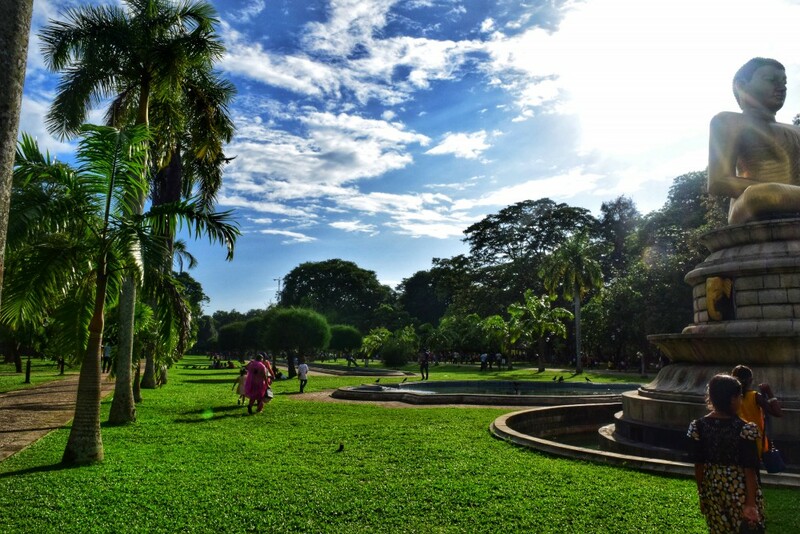 I wasn’t planning to stay another day in Colombo and it was just supposed to be a shortstop for my rest of the journey but then I got to know about a few places that I was tempted to see so I extended my stay here and headed to Viharamahadevi park, Wellawatte, Galle Face square, etc. I walked into the Viharamahadevi park as it was just 2-3 km from my hostel and then I just roamed freely around this place. It was the perfect picnic spot and was quite clean and bright and you could see families playing and friends hanging out here. There was also a Buddha statue in the front of this park which was really gorgeous. Overall, I think it was a good park to visit and if you are looking for a chill place then you would definitely love it. 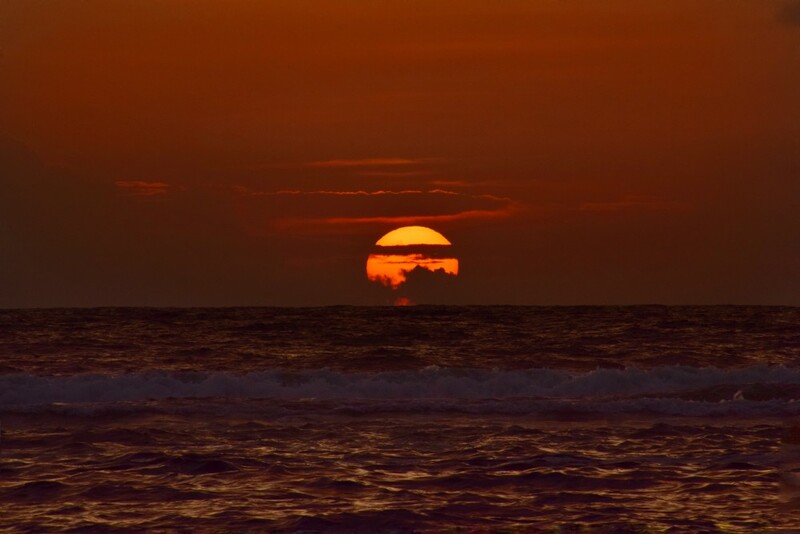 I took a bus to Wellawatte beach and witnessed a gorgeous sunset that was dipping into the wide ocean before me. It was truly a beautiful sight and as a sunset lover, I really enjoyed it. 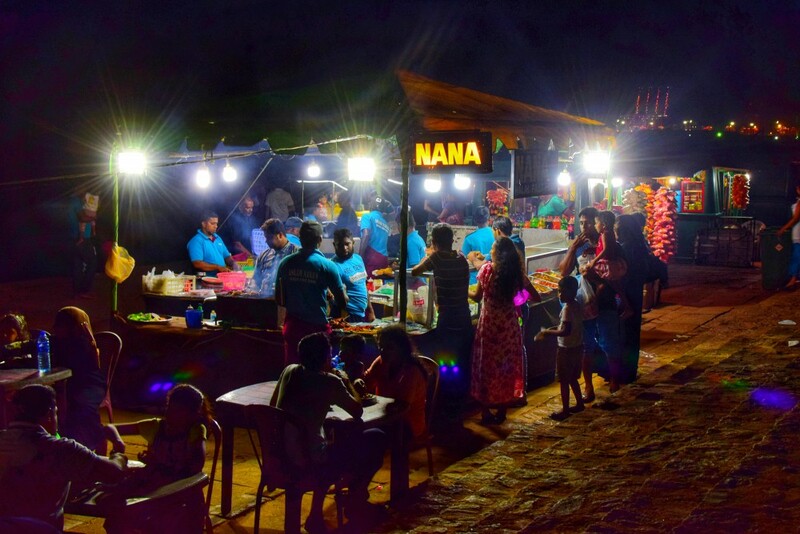 Then I headed to the Galle Face square, again by bus and ate the famous Chicken Kottu at Nana Shop, you will easily identify this big shop and can have an amazing plate of any Sri Lankan dish that you wish to try. At this place, I realized that one plate in Sri Lanka equals two plates of India dishes so I ate as much as I could and then I just walked around the ocean. This place was bursting with energy and it was jam packed which is not really my scene so I left in just a few minutes. On my third day, I left for Kandy via train and found a really nice Uncle on the way who told me about the Srilankan culture and amazing places. He was very sweet and offered me his play for stay too but I already had a CS host waiting for me so I politely declined. I reached Kandy in the afternoon, around 3 p.m. and I was quite astounded by this place. 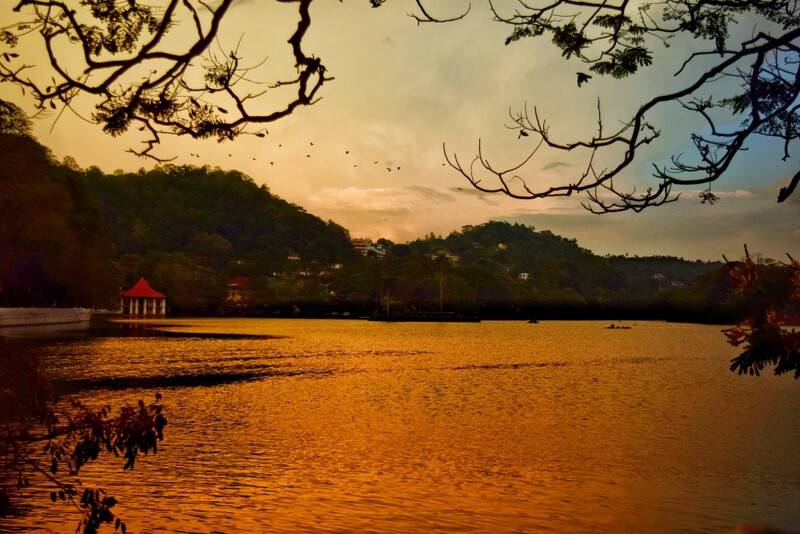 Kandy was completely different from what I was expecting, it was cool and pleasant over there and it felt like a cross between a hill station and a small town. One of the best parts about reaching Kandy was the train ride, I saw so many gorgeous mountains and views on the way and the train itself was pretty darn cute, it gave my entire trip a slight European touch. The train journey is quite cheap too and costs just 190 LKR (80-90 INR) for second class and costs just half for the third class. There is not a lot of difference between the three train classes and you get to experience an amazing view while traveling in it. Once I reached Kandy, I stayed with my Couchsurfing host who was really kind and generous. This was my first experience with CS host so I was quite nervous and excited at the same time. I really gelled well with my CS host and he helped me out with things to do in Kandy. We talked about many interesting things including Ayurveda, Palm reading, karma, etc. (I know it sounds all so philosophical but trust me, it was really fun). The next day, I got up early to explore Kandy and walked all around the city. Yes, it is quite possible to travel around all the places here even if you are on a tight budget, only if you are comfortable with walking. I personally love walking more than taking an auto so I did just that. First, I headed to the famous Kandy lake which is quite huge and really blue where you can see a plethora of fishes in the lake. I easily spent an hour or two here, just looking around and walking around the lake. 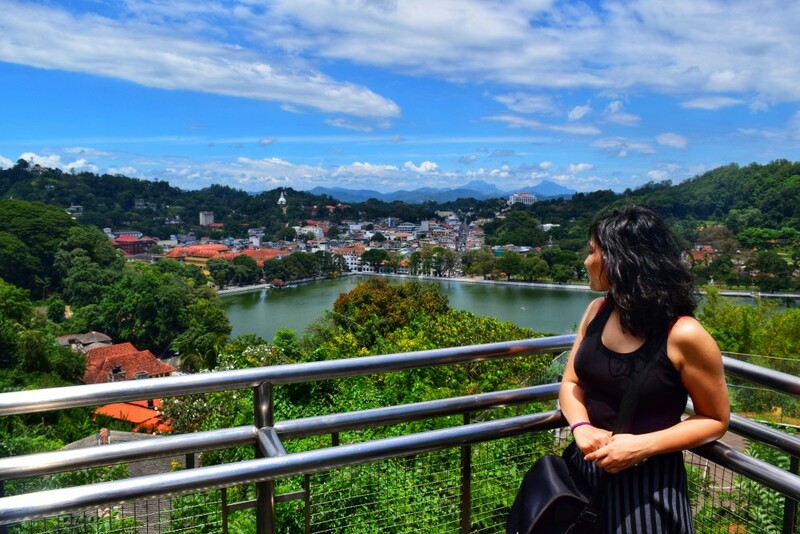 Then I headed to the Kandy Lake View Point from where you can look at the entire Kandy city. Again, I walked here and was quite surprised by the view before me, I could actually see the city which was full of Portuguese styled buildings, Buddha temple, mountains, etc. After looking at the view from here, I headed to a less explored forest on the upper side of Kandy but unfortunately, it wasn’t open and you need permission from the Municipal Corporation in order to visit this so I headed back to the lakeside. From the lake, I decided to walk to the Udawatta Kele Park here. To be honest, I don’t think the park was worth the entrance fee of 660 LKR (300-330 INR) but then again, I loved walking around the small enclosure. You will find another city viewpoint here and occasional deer. So, if you are interested in such kinda places then you can visit it else I would advise you to skip it. After walking around for 12 hours, I finally headed back to the house of my CS host and was introduced to a few other travelers from China and England. I found out that it was a Chinese girl’s birthday on that day so she had prepared dinner for us. So, all of us enjoyed a really delicious meal which included roasted chicken, broth, french fries, etc. and shared out travel and home stories. It felt so good to enjoy with those people and swap our stories, I certainly can’t forget that day ever. On my 5th day, I had planned to visit Sigiriya which is an ancient city in the center of Sri Lanka. So, I got up early and took the 8.30 a.m. bus to Dambulla, there is a direct bus at 8 a.m. to Sigiriya but if you leave after that then you have to take a bus till Dambulla. If you love historical places then you can also visit the Dambulla caves, unfortunately, I didn’t have enough budget to visit it so I decided to keep it some other time. From Dambulla, I took another bus to Sigiriya which took around 30 minutes. Always remember that there will be several people in Dambulla who will tell you that there is a bus to Sigiriya from Dambulla after every 30-60 minutes but that’s not true, you will easily find a bus to Sigiriya in every 10-15 minutes from this place so don’t opt for an auto, it will cost you 500 LKR (200-250 INR) for no reason at all. Sigiriya is basically a town made by an ancient prince in order to protect himself from his brother after he betrayed him. It is basically a Lion Rock structure which you have to climb in order to reach the top. There is a really interesting story behind the construction of Sigiriya Lion Rock and you will learn more about it in the nearby museum. You will have to get a ticket to enter the structure which will also include a ticket to the Museum, Mirror Paintings, and the Lion Rock. It will take around 1-2 hours to climb up depending on how much time you spend at each stop and you can easily climb down in 30 minutes. Once you reach the top, you will see forests surrounding this rock and many huge mountains in the distance. Trust me, it is a really beautiful sight and you would be a complete fool to miss it. 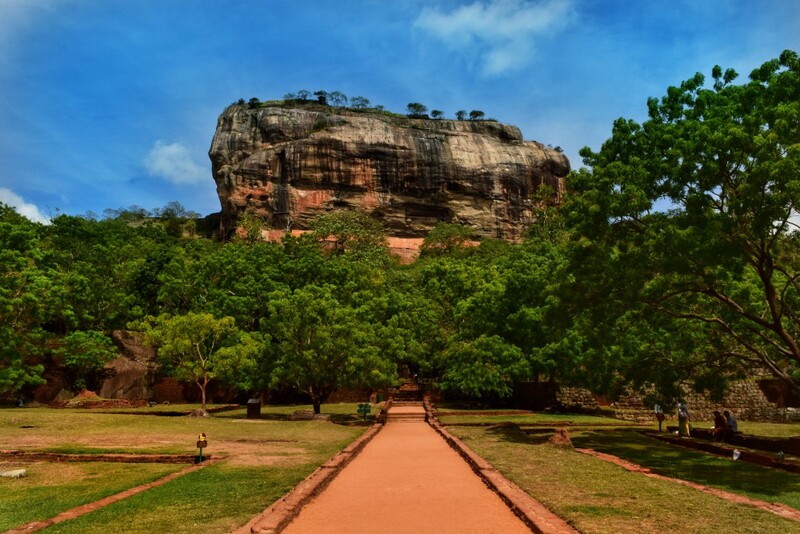 Overall, Sigiriya is a place to visit if you like history and trekking. You can easily spend an entire day here but if you are taking a bus then you would need to leave by 5 p.m. because the last bus from Sigiriya is around 5-5.30 p.m. to Dambulla. If you are from one of the SAARC countries, then you just need to pay half the price but do carry your passport as proof. I was so tired after the entire day but it was completely worth the exhaustion. 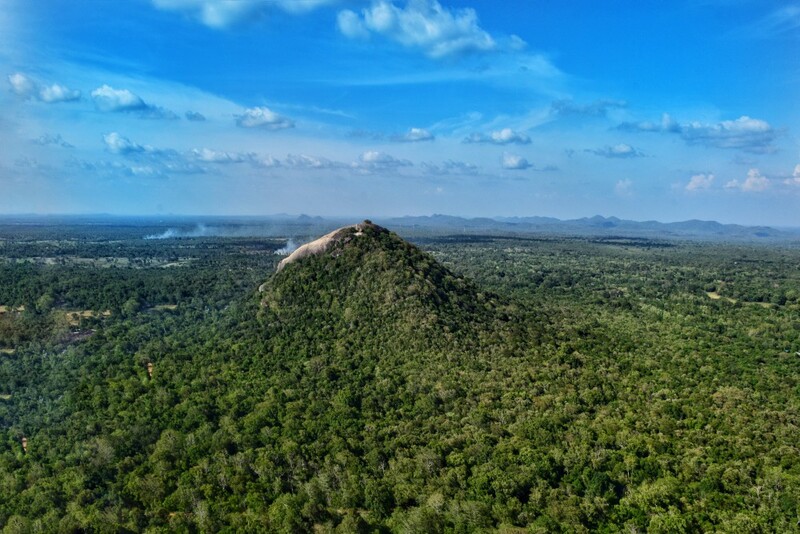 Here is everything you need to know about climbing Sigiriya. On my sixth day in Sri Lanka, I took a bus to reach Nuwara Eliya. I couldn’t even anticipate the cold and the view that awaited my eyes. It took me around 5 hours to reach the town and what a town it was! Everywhere I look, the mountains surrounded me and tea gardens lay in front of me. The air was crisp and clear and I thoroughly enjoyed my bus journey. 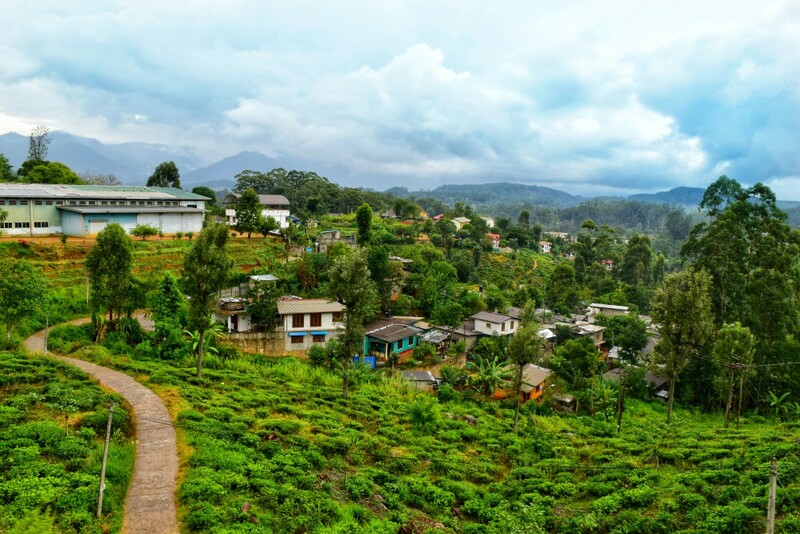 It is said that the view from Kandy to Nuwara Eliya on the train is equally mesmerizing so you can opt for a train too. However, the trains timings from Kandy are tricky and it would easily take you around 4-5 hours to reach so plan carefully. Once I reached Nuwara Eliya, I contacted my Couchsurfing Host and had an amazing time in his restaurant Humbug Restaurants. I had a cup of hot chocolate with a chicken sandwich and I can’t even tell you how really amazing it was. Trust me, you have to try the Humbug restaurant when you are here, it has a warm and cozy atmosphere and an equally amazing food. After I freshened up a little in my room, my CS host took me to the Ashok Vatika (If you have heard Ramayana then you would know this is the place where Ravana kept Sita after abducting him.) garden which was just opposite to the restaurant. This place charges around 1250 LKR(600-650 INR) for the foreigners and just 60-100 LKR (30-50 INR) for the natives so my host got a ticket for himself and me and snuck me in. The park was really beautiful and was blocking with various flower colors which made the whole place look more charming and inviting. However, to be honest, I wouldn’t suggest you to visit this garden because it is really expensive and not worth the exorbitant cost but if you do get a nice local to sneak you in, then do go for it. This was one of my favorite days in Sri Lanka. 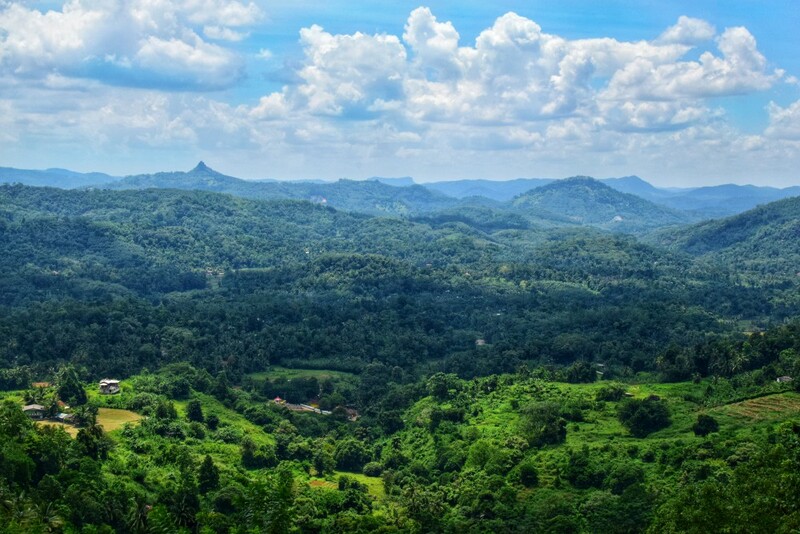 When I had first started looking for the places to visit in Sri Lanka, I came across the Horton National Park which boasted of a point known as World’s End and the photos look so amazing that I made up my mind to definitely visit this place. This was easily the most expensive leg of my journey and cost me around 3000 LKR (1500 INR) to go to the park and come back in an auto and the entrance ticket cost me around 4050 LKR (2000 INR). So if you don’t like the pictures then I would suggest you not to go. I would have seriously regretted it if I hadn’t visited the place so I didn’t take a chance. It was totally my kind of place and I really loved it here. You have to walk around 10 km to complete the circuit where you witness a waterfall and the highest point of this park. You also see a few animals here and there, depending on the time and the season. It took me around 5-6 hours to explore the entire place and then head back to the room. I also met this amazing lady who was exploring the place with her friend and she was very kind and helpful to me through the entire journey. In the evening, I traveled with my host to the city and just explored the market city. We also had an amazing meal at a place called The Pub in Nuwara Eliya town. Trust me, this was a really beautiful pub with a great ambiance which served really delicious food. On my 8th day, I left for Ella via train. I had to change two buses in order to reach the railway station and then caught the afternoon train. Thankfully, the weather was nice and it was raining occasionally so I really enjoyed the journey. I also met a cute Chinese kid, a Manipuri girl and a few Sri Lankan guys on the way which made the journey even more enjoyable. Trust me, this is one train ride that you don’t want to miss out on. As the train makes its ways through the numerous tunnels and several tea gardens, you just marvel at the beauty surrounding you. Once we reached Ella, I took the Manipuri traveler with me to my CS room which had a beautiful view and looked really good from the inside as well. I had a clear view of the mini Adam’s peak and we could see all the mountains surrounding us. It was pretty chilly here and the air was clear and pure which is why we could see numerous stars at the night. We went to the main town area in the evening to just explore and had a delicious meal at a local joint. After that, we came back and just observed the clear, black sky and the moon rise from behind the mountains. I still remember that night sky and how marvelous it all looked, I wish I could have taken a picture then but my camera had started acting up at that moment. We were supposed to visit the mini Adam’s peak, Nine arches bridge, etc. but due to constant rainfall, we weren’t able to do it. So, we just headed out to the Ravana cave and Ravana waterfalls in the afternoon and then came back to the city for some light lunch. 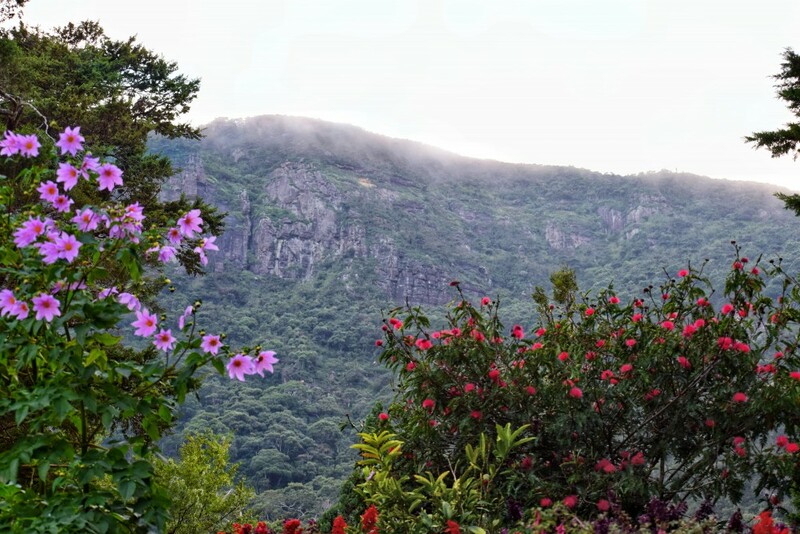 I would advise against the Ravana waterfall because there isn’t really much to see there and if you are interested in waterfalls, then there are many amazing waterfalls to check out on the way from Kandy to Nuwara Eliya. Even the Ravana Cave wasn’t that much of a sight and I really wish I had traveled to Adam’s peak or Nine Arches bridge instead. Probably next time! In the evening it started raining again, so we just enjoyed the view from our place and then enjoyed the nightfall. I especially loved this Cafe called Jade Green in Ella where they were playing live music and had one of the most delicious pancakes and desserts. It was a high-end place but it was completely worth the price and for once, I didn’t mind splurging a little. On the 10th day, I headed to Mirissa on a bus. There weren’t any direct buses to Mirissa so I had to take a bus to Matara and then get a local bus from there to Mirissa. You will find frequent buses to Mirissa from Matara which take barely 30-45 minutes to reach. Mirissa is a quiet place and you won’t find a lot of people staying in this area, most people stay at Unawatuna or Galle. So, I enjoyed walking around the shore and just looking at the sunset from behind the hill. I stayed with another CS host here, an Italian uncle, who was really sweet and kind. He told me how I can travel around and made really amazing food at home. It started raining in Mirissa as I reached so I just enjoyed a quiet lunch with my host which was roasted chicken and salad ( Yum, right?). Then, in the evening I went to the only beach in Mirissa and spent some time there. 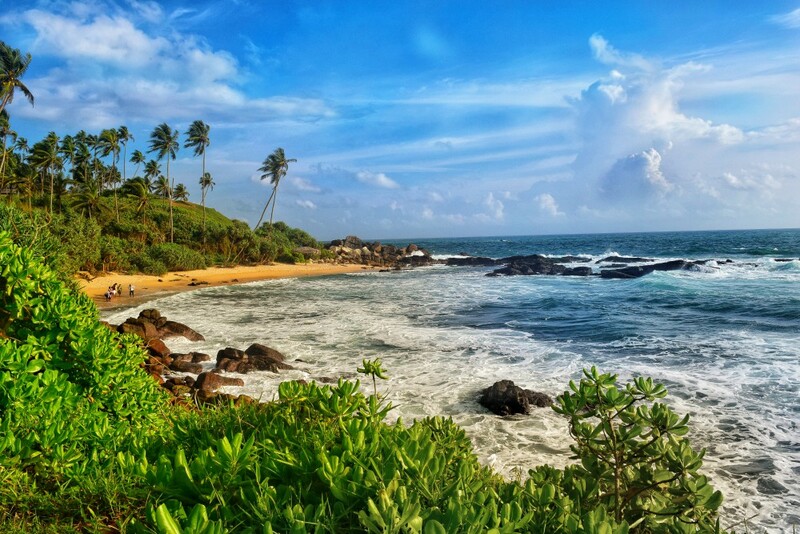 Frankly, there isn’t a lot to see in Mirissa so you can go to other beaches for some fun and sightseeing. On my second day in Mirissa, I headed to the Unawatuna beaches to inquire about the Scuba Diving course and just explore the area. I took a bus from Mirissa to Unawatuna which cost me around 50-60 LKR (25-30 INR) and then came across the Diver’s Land Scuba Diving store. I booked my slot for the next day morning and then I just hung out at the Unawatuna main beach. It is quite beautiful and you can see a Japanese Pagoda in the distance. Around 3 p.m., I headed to the Unawatuna Blowhole which was behind the Blow Hole restaurant. I walked from the beach to the place and it took me around 20-30 minutes. 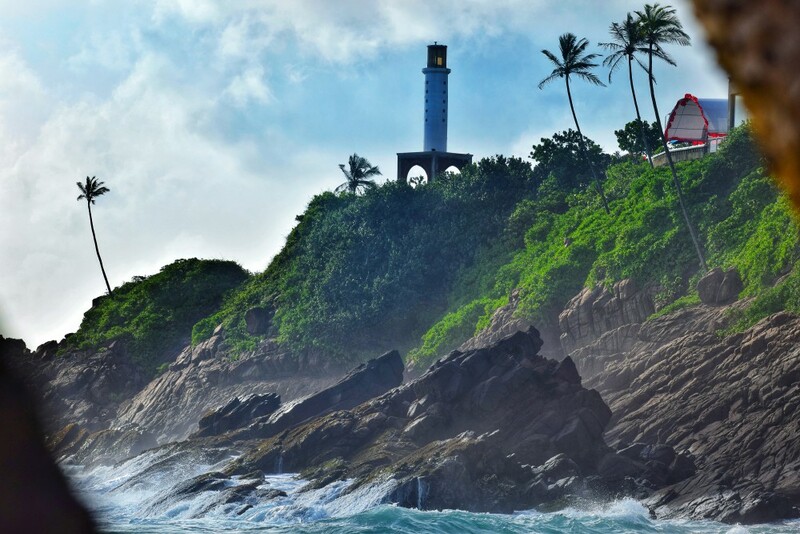 If you visit Unawatuna, make sure you don’t forget to visit the Blow Hole. It looks like heaven and you get to see the entire ocean without anyone disturbing you. After some time at this place, I headed to the Jungle Beach in Unawatuna. I took an auto since this beach can only be reached through a slightly elevated path. 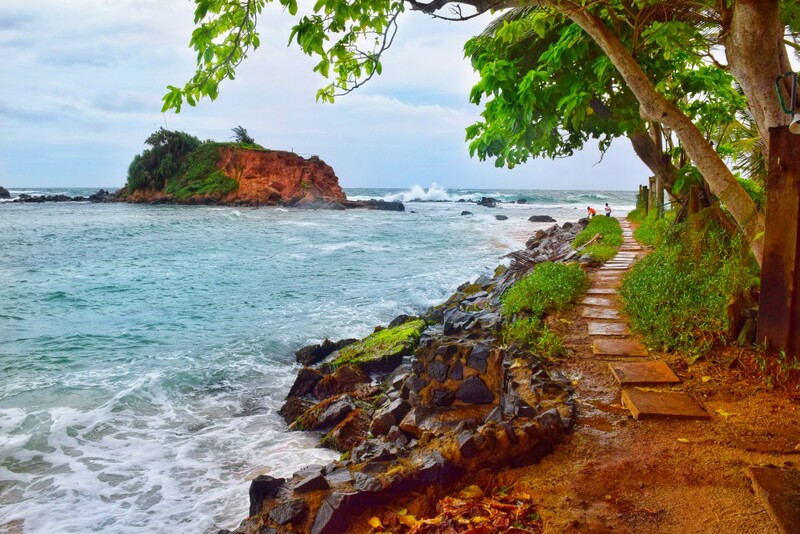 Once you reach the starting point of the beach, you need to walk some 10-15 minutes to actually reach the beach. Once you are at the beach though, the view completely blows your mind. The beach is secluded from the main town which is why it is so quiet and calm and I didn’t see a lot of people here. Also, you get to see a really magnificent sunset here with the jungle hill as your subject. Although I would advise solo female travelers to avoid going here during sunset because it becomes dark and a lot of people might trouble you while going back to the city. I would recommend everyone to visit these three places in Unawatuna whenever you are visiting Sri Lanka. That day was a huge day for me as I was going for my first Scuba Diving experience. You can know more about it on Scuba Diving in Sri Lanka post. The sea was a little rough as a storm was approaching but supposedly it was a good condition for scuba diving so I geared up for the experience. I can honestly say it was one of the best experiences in my life and I am quite determined to complete the entire scuba diving course now. I spent half day in Scuba Diving and then I headed back to Mirissa to just relax and unwind a little. I went back to the Mirissa beach in the evening and then just chatted up with my host. He told me really amazing stories about his life and made Egg Pasta for me which was really delicious (Previously, I wasn’t really a Pasta fan but after his cooking, I certainly am!!). Early morning, I left to visit the other places from Mirissa and stopped on my way at the Midigama beach but since it was burning hot, I just headed towards the Unawatuna beach to have a meal by the sea. 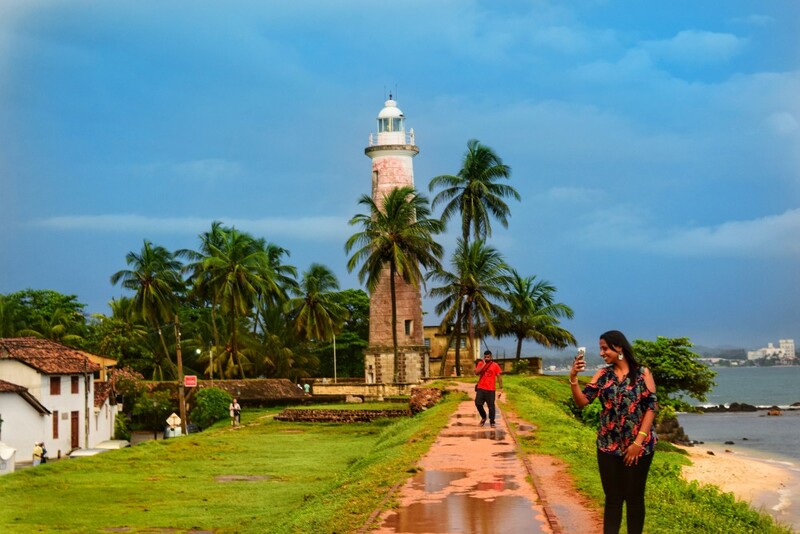 After some time, I headed back to Mirissa to check the Mirissa lighthouse. It is not an actual lighthouse but it’s a decorative lighthouse inside a resort. There was a wedding going on over there so they let me chill at their private beach before letting me in to see the lighthouse. I just observed the crabs and the waves on the beach, mesmerized by their movement and really enjoyed myself there. Finally, after some time I could go and see the lighthouse. While the lighthouse is not extraordinary, the private beach certainly was but I am not sure if they allow everyone to just waltz in, I guess I was just lucky. After that, I walked to the Mirissa beach waiting for the sunset but due to the clouds surrounding the sun, I couldn’t see it properly. I left for a hostel in Unawatuna and as fate would have it, it started raining the moment I reached (It seems that the rain was following me all the while I was in Sri Lanka). Finally, once the rain stopped, I caught a train to Galle and headed to the famous Galle Fort on foot. It started raining again in between but after some time it stopped so I was able to enjoy properly. Galle Fort is a beautiful place to visit and contains really amazing Portuguese buildings and places. The streets remind you of an 18th-century alley and transports you to a European city in an older century. As usual, it was raining so I waited for the rain subside before leaving for Galle again. Again, I just roamed around and cover the other side of the fort city and just enjoyed myself. I saw the Galle Fort Lighthouse and several other structures. Make sure that you dedicate an entire day to this lovely place because you would really enjoy walking around on the streets. If you happen to love photography then this is the perfect place for you, I am really not kidding. It was finally time to head back home so I took a morning bus to Colombo from Galle and reached the airport 3-4 hours before my departure. All in all, I had an absolutely fantastic time in Sri Lanka and only wish that I had some more time to visit this beautiful land. I certainly plan to go again and revisit some of these places and visit a few other places that I missed this time. So, wish me luck. Looking for some good accommodation options in Sri Lanka? 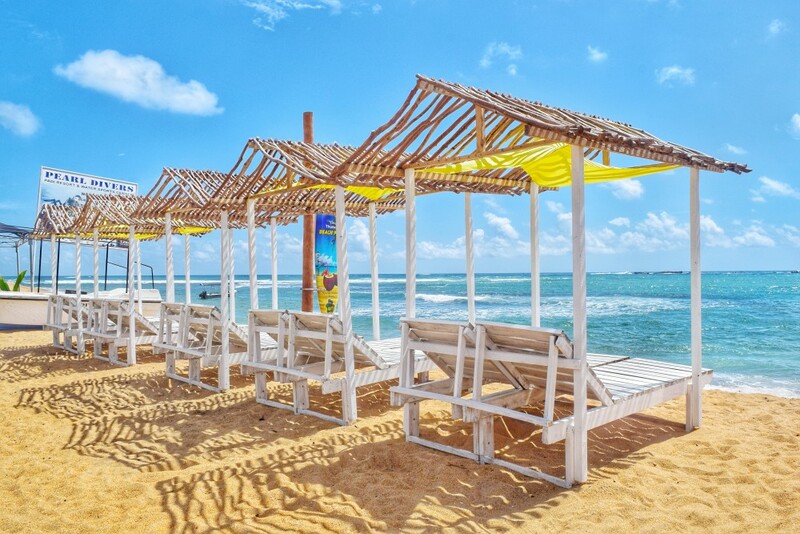 Then, you can check out this article on accommodations in Sri Lanka to choose a stay which suits your budget! Nice narration and details. Will certainly help me plan one. Many thanks !! Amazing made me speechless. 👍 Much appreciate the way you have narrated the entire journey superb.